You can give us a call today to discuss solar energy systems! Otherwise, continue reading this blog post to learn more about how smart grids and smart homes work together to create better, more efficient energy consumption. A smart home is a residence that can control its heating, lighting, and appliances remotely with a phone or computer. You can also connect your energy use data to your phone or computer to make decisions on when and how to use your energy in a more efficient manner. The big difference between a traditional home and a smart home is that you’re always connected to your smart home, whether you’re on the other side of the world or down the street at a neighbor’s house. A smart home functions as any other home does. As a homeowner, you’re able to manage your home remotely using your phone or computer. This can be anything from your heating/cooling, lighting, smart appliances, and more. A huge benefit is your ability to adjust your home’s energy use no matter where you are in the world. Although a smart home may look like any other home, a lot is going on beneath the surface. Data about energy use, time of use, and more is being collected so the homeowner can make the best decisions possible on how to use their home more efficiently. Why is making the switch to a smart home important? The simple answer is money. As a smart-home owner, you will see savings on your utility bills. A more efficient home uses energy at better times during the day and in lesser quantities throughout the day, which results in lower utility bill costs. If you want to get really smart with your home, you can upgrade your lighting, energy use, appliances, and more with a home automation kit. These include comprehensive installations for climate, lighting, entertainment systems, and more to accommodate your budget and lifestyle needs. How much can I expect to save on utility bills? In the average household, a savings of a few hundred dollars can be expected per year when the switch is made to smart home technology. Although this doesn’t seem like a worthy investment from a numbers standpoint, consider how you make decisions in the rest of your life. You purchase items and services that are of great quality no matter the cost. A smart home upgrade will do more than save you a few hundred dollars; it will help the environment, creating a better future for you, your family, your friends, and your community. Can I store energy using a home battery? At West Coast Solar, we encourage the use of home batteries to store energy for later use. However, we do strongly encourage you to consider why you want the battery. If you’re getting a battery just to store power you’re already going to use from the grid, the savings will be negligible in most cases. If you’re looking to install a solar power system, a home battery bank is a great option to store energy you produce for later use. In some cases, it’s better to store the solar energy than send it to the grid for a credit on your utility account. How does a smart grid affect my smart home? As mentioned in part one of this blog series, a smart grid offers a two-way communication between the grid and the building to be powered. This allows for smart-home owners to remotely adjust their supply and demand of energy at a moment’s notice. You can program your smart home to use less energy during estimated peak hours and use more energy during non-peak hours, which saves you money on your utility bills. 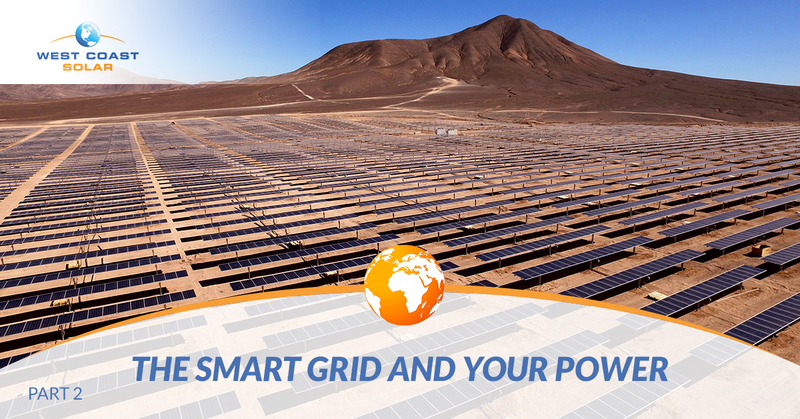 The smart grid and smart home connection creates the opportunity to be more environmentally and fiscally responsible with energy consumption. What does a smart grid do for my smart appliances? First, smart appliances allow for homeowners to monitor, adjust, and change their energy use based on data collected for prior energy use. This allows the homeowner to control every aspect of their energy use down to the very kilowatt of energy consumed. Second, smart appliances typically offer a lesser energy draw when not in use. If you monitor most non-smart appliances they draw energy even while not in use, which can raise your utility costs. A smart appliance like an oven only draws energy when it needs to be used, not when it’s in the “off” position. Finally, a smart grid and smart appliances work together to not use energy during peak hours. A smart grid can signal your smart home to avoid using energy at certain times during the day, which saves you money on utility bills. You may have to wait until later in the day or wake up earlier in the morning to do laundry, but that’s worth the hundreds you could save on bills. Give West Coast Solar a call to discuss renewable energy! Want to save money on your utility bills, help save the environment, and create a better future for your loved ones? Then make the switch to solar power. At West Coast Solar, we are 100 percent committed to renewable energy as the way to power our lives. The technological advances with smart grids, homes, cars, appliances, and more, there’s no reason we can’t save money, use energy, and help the environment. Read part one now if you missed it. Otherwise, enjoy reading part three of this blog series. Ready to discuss solar panel installation on your home? Call us today!